Ask Unclutterer: What is clutter? Why do so many people seem to think that if something is small, it isn’t clutter? Is the clutter in most people’s houses composed of large items? 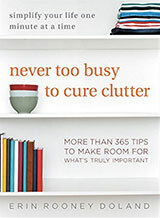 Just what kinds of things do most people consider to be “clutter”? My definition of clutter has nothing to do with size. Clutter is any distraction that gets in the way of a remarkable life. Clutter doesn’t have to be physical — you can have time clutter or mental clutter or even bad processes that qualify as clutter. I think most of us have had toxic relationships that have been clutter in our lives. Stuff definitely can be clutter, but it’s not the only form. That being said, most physical clutter that I have encountered in people’s homes and offices is small stuff. Spaces just can’t hold a lot of big items. So, in terms of quantity, it’s the small stuff that takes the title. One thing that is also important to distinguish is that clutter and disorganization aren’t the same thing. If an item is useful and used or is inspiring to you, it isn’t clutter. However, if that useful or inspiring item is without a proper storage place (a place for everything and everything in its place) then you will be distracted by it the same as if it were clutter. The lack of an organized solution is clutter, not the object. Additionally, what constitutes clutter for one person isn’t necessarily clutter for someone else. And, people have different thresholds for how much clutter they can have to achieve their remarkable lives. I don’t organize or regularly unclutter my sock drawer, and I’m okay with that. To focus on what matters most to me in life, I don’t need to have a pristine sock drawer. I rarely wear socks, so I just don’t come into contact with this drawer much at all. A drawer full of hole-ridden socks in complete disarray, however, might drive someone else batty and waste a great deal of their time. We’re different, and that is magnificent. I’m also interested in reading other people’s definitions of clutter, so I hope that this post receives many comments. Your question was thought provoking and a good one to ask. I believe that formulating your own definition of clutter can go a long way in helping get it under control. Thank you, Jennifer, for submitting your question for our Ask Unclutterer column. I think clutter is anything that interferes with the peace of a space, that disturbs what it is. A space, or even a portion of a space, needs to dedicated to something, whether it’s reading, artwork, cooking, dining, whatever. If we lived in traditional Asian homes, our space would be clean. Everything would be put away after use and the same space/room would wear many faces. I saw this wonderful Japanese dining table in Bangkok with all the dishes and silverware stored in compartments under the surface of the table. Sliding wood panels opened to reveal the storage. This would be my ideal. An almost meditative space with everything built-in so the room would have the feel of a sunlit oasis in a forest, maybe. Hard to put into words. Thank you, Unclutterer staff for always presenting such interesting and thought-provoking articles. Great definitions here, I am glad you brought up the different thresholds. My clutter threshold is signifigantly higher than my husband’s and signifigantly lower than my children’s. Also, Different zones in my house have different levels of tolerance. The living room is a more minimalist zone, a place to rest. The kitchen counters need to be clear for me to cook effectively (and I cook every meal at home for the family). But my home-office is a zone of utter chaos to the casual observer, and no matter how often I clean it off, it piles up again in a few hours of use. Somehow it doesn’t seem to negatively affect the creative process… but it can negatively affect my information retrieval (which note under what pile?). As far as I’m concerned, physical clutter is anything that doesn’t have its spot or isn’t where it’s supposed to be. Everything has its spot in the house, and if it’s not there, it drives me to distraction till it is. I don’t care if things are in a neat pile – if it’s not where it’s supposed to be, it has to be fixed! I like having spots (in-trays for instance) where ‘To-do’ items go, so that nothing needs to ever feel out of place. In the unavoidable cases where we do have to have stuff in temporary spots (new furniture that needs assembling, etc) it gets fixed that very week. Hmm, I might be a little OCD, maybe? Good article and good posts, too. I love the idea of a dining table that allows us to store the dishes! For me, clutter isn’t about distraction but what you feel, say, or think when you actually *look* at it. If you make a face or grit your teeth or purse your lips, or your mental noise is ‘ugh’ or ‘grr’ or ‘feh’ or ‘ew’, then it’s clutter whether it serves a purpose or not. So my definition of clutter includes functional-but-ugly and necessary-but-annoying. The point is to be able to live normally without having annoying stuff pestering me mentally. Of course, I’m the kind of person who is afflicted with useful-but-ugly much more than duplicate or unnecessary. Not that I don’t have duplicates or unnecessary stuff, it’s just that the ugly and annoying stuff outnumbers it, probably because I have a hard time getting rid of functional stuff just because there’s a prettier one somewhere else. I keep wanting to wait until the ugly stuff breaks or proves its functional inferiority.. Everything from the half-empty bottle of bubble bath I really didn’t like very much to the inboxes I want to trade out in favor of something vertically-oriented.. I agree with @shris. Clutter is anything that prevents me from fully enjoying and being happy in my space, and esthetics is a big part of it. So while I agree that “organized” doesn’t have to be “pretty”, for me a comfortable space (that I’m happy in) has to be both. I think I go along with Emerson’s quote about things needing to be useful or beautiful. Once I started using this definition, I was able to declutter my home. My husband and I were thinking about purchasing a larger home, but after decluttering we realize that we have more than adequate space (almost 1300 sq. ft.). Lately, our television of 19 yrs. died so we have replaced it. Unfortunately, the new T.V.s do not fit the old entertainment armoires; I am having to get rid of my very favorite piece of furniture – the armoire. There’s no place in our home for it to fit and it will not double as a piece to hold clothes very well. I am donating it to a thrift store which benefits a woman’s shelter because even though it’s well-made and beautiful, it just isn’t useful to me any longer. I am hoping it will be useful to someone else, though. My definition of “clutter” is anything that you don’t like, don’t use, have too many of, and/or doesn’t mean something to you. If you keep your old letter jacket from high school but never wear it, unless it is somehow meaningful to you, it’s clutter. If you have endless boxes of office supplies but keep buying more just because they’re on sale (like my brother does) – it’s clutter. My in-laws still have all their kids’ old toys and things like that – no one’s using them and no one cares about them, but they just can’t let go. If you’re not enjoying something, why keep it? It’s just taking up space and it’s not adding to your life in any way. THAT is clutter – keeping the things that add zero value and enjoyment to your life. Your space should reflect who you are and be comfortable to you. That means you should only have items in it that you love, use, or that mean something to you. Everything else is a waste. If people could stick to those simple rules there wouldn’t be much of a need for storage units or houses of a billion closets. Erin, I want to mass-distribute this article to just about everyone on Earth. 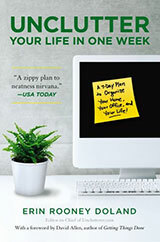 You’ve captured it perfectly: clutter isn’t about size, it’s about the obstacle(s) it presents to your life. And I agree, most clutter is small: receipts, junk mail, socks — maybe that’s why it piles up so easily. It’s amazing to see how many different definitions of clutter there are for people! It’s also very interesting to see the distinctions that different people draw between “cluttered” and “disorganized.” I hadn’t thought about that before, but now I realize that my own definition of clutter has nothing to do with whether or not something is organized. I had my keepsake boxes all nicely arranged and organized based on who they involved or what time of my life they were from, and they looked nice on the shelves… but I came to the conclusion that I would be just as happy AND have more space without them, so I considered them clutter. I guess for me, it isn’t so much about whether an object has a good place in my house right now, but more about whether I’d still think it was worth having if I had to pack it up for a move. Reading everyone else’s definitions is incredibly enlightening. 🙂 Great responses! Thanks for this — that’s an important observation, I think, that what amounts to clutter is different for each person. I would think of clutter as something you know is getting in the way of achieving your goals, but you still find yourself tensing up at the thought of throwing it away. And “decluttering” becomes a matter of getting more comfortable and familiar with that tense, anxious feeling so that it no longer seems so threatening and you can act in spite of it. I use the three-question test. 1) do I use it? 2) do I enjoy it? 3) can I replace it if I should ever need it? Most times the answers are no, no, yes, and goodbye to the Thing. I keep a lot of Things that many would consider clutter because I enjoy them and they don’t impinge on my living space. But my enjoyment test is getting stricter. I really enjoyed reading this post. I agree with the assertion that clutter is not strictly small objects. I recently gave up my large desk with ample drawer space to make way for a new crib. Changing my office over to a nursery required some creative thinking on my part. I found that I don’t require a huge desk with tons of storage space in order to work efficiently. I carved out an area in my kitchen and find that I now work much more efficiently without all the desktop and drawer space – and everything stored therein. Everything I need is now out and within reach. The small chrome shelf I now use to house both my office supplies and my overflow kitchen appliances may look cluttered to some because there are several small objects out, but it functions incredibly well for me. When I was getting ADHD coaching, I was once told that clutter is the result of an incomplete task, which is a definition I like a lot. It’s definitely oriented towards a thing-based view of clutter, in that you started something but didn’t finish cleaning up or didn’t resolve the final location of where something belongs. It doesn’t say anything about organization, much like Erin’s observation that her sock drawer may be a bit disorganized, but it isn’t cluttered and she’s okay with that. If you think about it some more you can extend the definition to other aspects of your life. If you need to resolve something first before achieving a goal in your life, it’s a form of clutter. It removes the value judgement from the decision as well and makes it easier to throw things out or remove problems, people or other things from your life. Great post Erin! As someone who makes my living helping others to simplify their lives, I think about this concept a lot. In my world, clutter is ANYTHING that keeps you from being your best, most powerful, effective and joyful self. Period. Physical items, mental distraction, negative relationships, toxic workplace, bad eating habits, negative thinking patterns, boundary-less and out of control children, etc etc etc… they’re all roadblocks that prevent you from realizing your full potential as a human being. oooh! I love these insights! My immediate word for clutter was “tension”. The things that you see that cause you to be agitated when you walk into the room, the thoughts that can overwhelm you, the commitments that you dread. The longer I live in a place, the more things I accumulate. There was a long time when I had a couple of little divided plastic boxes with office supplies in them, a bin of craft supplies,a bin for cookware, a few shelves of books and a couple of suitcases of clothes. I can still visualize how to pack that load in my old car. Now I have so much stuff that when I come across it, I can’t remember when I bought or used some of it! Is it over consumption or maybe premature dementia? All excellent answers to an excellent question. Clutter is something that many of us deal with on a daily basis either personally or professionally and yet the definition is somewhat different to everyone. I think that is good, but I really think that the word “stress” needs to be included. If it weren’t for the stress brought on by clutter, I don’t think that the word would have nearly the impact that it does. What is clutter? It is all the stuff in my bedroom that has been shifted there from other surfaces in the house when people come to visit. Its the unfinished craft, important and unimportant bits of paper, toys waiting to be repaired, clothing that ended up in the wrong basket and the general flotsam and jetsam of life that I cannot bring myself to just toss out. Its the stuff I’m too tired to put away because I spend all day returning things to their proper places, allocating places for homeless items or dealing with stuff that no-one else in my family (one 9 yr old son with ADHD, one 5 yr and a husband who I am sure is also ADD)seems to be worried about doing and will not do unless I stand over them (a huge waste of my time because I cant do other things while supervising them). Its anything that I cast my eye over or sort through while lamenting that I just cannot find the things I bought for a specific purpose and then have to repurchase! I am working on it since subscribing to this site early this year – we’re not there yet, but we’re closer than we were. A very interesting question. I’ve long thought that organization and clutter are separate, albeit related, things. Organization is pretty easy to agree upon, the usual unsettled question is the archtypical pile-o-stuff that the owners knows exactly what’s in there and where. @shris: It sounds as if you can give yourself permission to get new inboxes. You say you don’t want to replace something till it proves its functional inferiority. Your description of vertical inboxes implicitly include improved functionality as one of the benefits. So it sounds to me that, by your requirements, you can get new (or new to you) inboxes. I’m with Pol–anything on the floor is clutter; I don’t care if it’s precious gems! My definition of clutter is directly correlated to the item’s ability to cause bruises and cursing. I like your definition of clutter. Anything that gets in the way is a great way of looking at it. For me clutter is the fifty thousand gadgets in the kitchen, but to some that’s just essential cooking supplies. I decided after I wrote that comment that it was silly to be hung up about inboxes. 🙂 On Friday I picked up a new inexpensive inbox with vertical dividers and moved everything over. My desk is still a mess, but I think that area is more functional now. I like the idea that our personal clutter causes tension in the body. I call this Body-based Fung Shui. I have a room in our house that is mine (my office/guest room). My sweetie is not allowed in the room. I keep the house straight, but in this room I am free to do whatever I want, including strewing things across the floor if I want. This gives me a place I can relax and know that if I want to be messy I can. It may be strange, but it keeps me sane in a house where my sweetie gets disturbed about how I squeeze my toothpaste tube. I’m looking at buying a place as my landlord is returning. The size of the places I can afford range from 280 square feet to 420 square feet, so I am going to have to put all of my furniture and belongings into this space without it looking too crowded. Time to declutter and be ruthless I think. Why do I need twelve glasses? Why do I need a lounge and two armchairs? Well the answer is that I don’t. So hopefully the local charity can take them…. @shris: great! I hope your new inboxes are doing well for you. @Sarah: I did something similar some years ago, getting rid of several pieces too large to move myself. The local Salvation Army didn’t pickup but did suggest other orgs that did. A win all around. Cindy above attributed it to Emerson. But Wm. Morris was the author. And, given Morris’s impact as one of the founders of the Arts and Crafts movement, it is an apt description of his beliefs. In a way, the contemporary simplicity / decluttering movement owes something to the Arts and Crafts movement, which was in itself a reaction to the Industrial Revolution and the Victorian era proliferation of stuff — very cluttered interiors, decorative objects galore, doo-dads, statuary, antimacassars, etc. etc. For me reducing clutter has become a self-reinforcing habit. The more I reduce, and identify what is, clutter, the more I find additional ways to identify yet more stuff that is clutter, and ways to get rid of it or reduce it. The latest — scanning old files and financial records. A bit of historical trivia, in response to A’s comment, offered without contradicting his basic statement about clutter in the Victorian era. Antimacassars served an important purpose. Men in that era used Macassar Oil to slick down their hair. This oil got into furniture they sat on. The oil was organic and so would decay as well as soil the furniture and whatever came in contact with the furniture. Antimacassars were there to absorb the oil, protecting expensive furniture and clothing. This is the most helpful definition of clutter that I have come across. Thank you.